After turning Starbucks Corp. into the world’s largest coffee chain, Chief Executive Officer Howard Schultz will hand the reins to a lieutenant who could solidify its role as a technology company. Kevin Johnson, a 33-year veteran of the tech industry who became Starbucks’ chief operating officer last year, will take the helm from Schultz on April 3. The move is a nod to the company’s growing reputation for innovation: It introduced the world’s first successful mobile-payment service, beating out the likes of Apple and Google, and gets an increasingly large portion of its revenue from that source. Schultz will keep the role of executive chairman at Starbucks, focusing on the rollout of its upscale Reserve brand. Johnson, who joined the board in 2009, was tapped for the operating chief job after Troy Alstead went on sabbatical. Johnson, 56, previously worked at Microsoft and Juniper Networks. In 2008, he was named to the National Security Telecommunications Advisory Committee, where he served under presidents George W. Bush and Barack Obama. The CEO change jarred investors, who briefly sent the shares down as much as 12 percent, though Johnson was seen as a possible successor since he took the No. 2 job last year. For many shareholders and customers, Schultz has embodied Starbucks. Over the past three decades, he turned much of the world into coffee aficionados, bringing lattes and mochas to 70 countries. And he’s used the company to pursue social causes — occasionally clumsily — such as racial strife and sustainability. Schultz will focus on expanding Starbucks’ Reserve Roasteries, a chain of massive coffee houses that provide tastings and other experiences, as well as new Reserve retail stores. The executive has been working to position the Reserve name as Starbucks’ new higher-end brand. Schultz also will continue the company’s “social impact” efforts. As CEO, he’s already pushed to open stores in low-income areas and supported gay marriage. It hasn’t always gone smoothly. Schultz’s idea for employees to discuss race relations with customers was criticized as ham-fisted. Investors weren’t anticipating Schultz’s departure as CEO so soon, though having both executives focus on different parts of the company could have benefits, said Bloomberg Intelligence analyst Jennifer Bartashus. Starbucks’ digital and technology prowess has put it ahead of its peers, allowing it to serve more customers faster. Same-store sales rose 5 percent in the Americas region in the most recent quarter. Mobile payments accounted for about 25 percent of U.S. transactions in that period. Starbucks built on its tech leadership with an order-ahead feature, which lets customers select and pay for drinks in advance. They then can pick up the beverages at a shop without waiting in line. 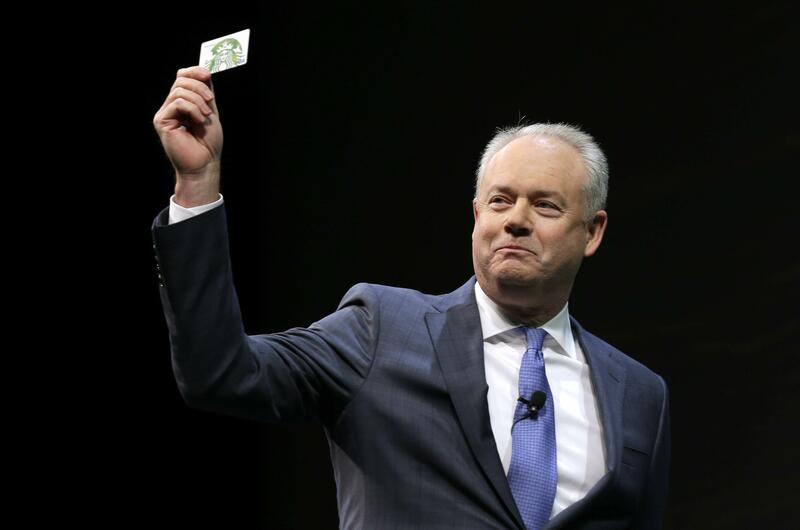 Since Johnson became operating chief, Starbucks has rolled out mobile ordering across the U.S. and even tested delivery. The Seattle-based company also is boosting spending on digital ventures, including taking its app and rewards platform to countries such as China. Though shares of Starbucks tumbled immediately after the announcement, they recovered some of that ground during extended trading. As of 5:54 p.m. in New York, the stock was down 3.3 percent to $56.58. This isn’t Schultz’s first retirement as CEO. After serving in the job from 1987 to 2000 — punctuated by an initial public offering in 1992 — he stepped down in 2000. But Schultz returned in 2008 after Starbucks faltered. The company had opened too many locations too quickly and got hit by the financial crisis. Profit plunged. Schultz put Starbucks back on firmer footing. The company now has the “strongest leadership team in history,” he said. It’s been speculated that Schultz might make a run for U.S. president, though he’s repeatedly said he has no intention of doing so. While speaking at a conference in New York last month, Schultz said he wouldn’t serve as part of President-elect Donald Trump’s cabinet. He also denied rumors of running for president last year in a New York Times opinion piece. It’s probably too early to tell if Schultz has designs on the White House, Bartashus said. Published: Dec. 2, 2016, 8:20 a.m.